License plate recognition is a mass surveillance technique used for identifying registered vehicle plates. This guide shows you all the information needed for using the function. Follow the instructions and descriptions written below and you will be able to implement the license plate recognition successfully. For the implemention use the help of your C# camera application. To succeed, OZEKI Camera SDK has to be installed and a reference to OzekiSDK.dll has to be added to your Visual Studio project. License plate recognition is an extremely popular function nowadays. You can benefit from it if you wish to analyze and detect license plates in a given area where a camera is placed. This function of the Ozeki Camera SDK can be an effective help for those who would like to create monitoring or surveillance systems based on license plate recognition. There are a lot of fields where the license plate recognition function of the Ozeki Camera SDK can be used. With the help of the license plate recognition you can develop an intelligent transportation system or help the work of border control systems. What is more, you can analyze the traffic, the parking habits or improve the security of a parking area. We can mention other situations where license plate recognition can be used: in security monitoring, vehicle surveillance, theft prevention, controlling traffic rules. What is more, with the help of this function you can draw up a complex database of traffic. 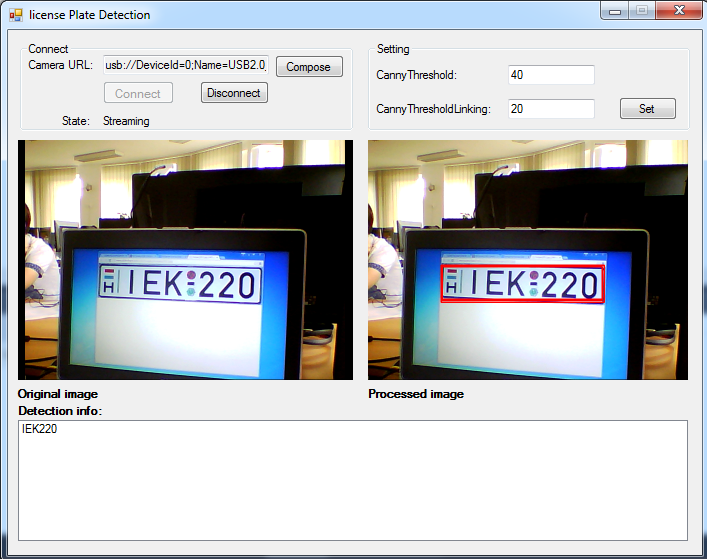 For detecting edges we can use the ILicensePlateRecognizer object of the Ozeki Camera SDK. After an instance has been created with the help of the static ImageProcesserFactory class we can detect on frames and on video as well. This is a mediahandler from a VideoHandler class (so it is VideoReceiver and VideoSender at the same time) which means that the input can be a VideoSender (for example WebCamera) and the output can also be created for a VideoReceiver. These connections can be built with the help of an instance of the MediaConnector class in the SDK. No actions are executed on the input frames they are simply forwarded by default. However, the object which implement the IImageProcesser interface (for example the ILicensePlateRecognizer) can be added with the help of the AddProcesser() method. More instance can be added which implement IImageProcesser, they will run one after the other using the image which is before them in the list. The example uses the FrameCapture mediahandler as well which examines only every fifth frame. You can find the descripition of Frame capture here. Webcamera instance, with the help of this we can get the images. Using this we can connect the mediahandlers. This is a Mediahandler, which runs the IImageProcesser interface (this processes the images) on the incoming video. This is an image processer interface which can detect license plates, this implements the IImageProcesser interface. With the help of mediahandler we can determine the frequency of processing on it. This is a GUI tool which is responsible for displaying the video for Windows Forms applications. The initialization of the global variables is the task of the Init() method. The instance of the FrameCapture mediahandler are set here and the ILicensePlateRecognizer instance is also created here with the help of the ImageProcesserFactory. This also can be added to the ImageProcesserHandler instance. The processing of all images is indicated by the DetectionOccuredevent of the ILincesePlateRecognizer instance. Here we can subscribe to this event. This method fills the TextBox-es which can be found on the GUI with the actual settings of the ILicensePlateRecognizer instance using the InvokeGUIThread() helper method. After the initializations the mediahandlers can start to operate which is the responsibility of the Start()method. 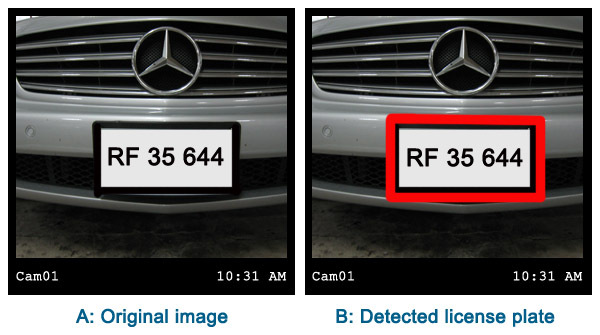 There are two main steps during the license plate recognition: the detection of the license plate itself (detection) and the recognition of the number on the plate (recognition). Most of the configurations refer to the first step. ApertureSize: The Aperture value which is used for the edge detector algorithm. CannyThreshold: It is used for detecting the edges during the whole detection. The value of the thresholding is determined by the CannyThreshold. CannyThresholdLinking: It is used for detecting the edges during the whole detection. MinArea: The minimal size of the license plate. MaxArea: The maximum size of the license plate (If the provided value is 0 then it will be ignored). MinWidthHeightRatio: The minimal width-height ratio of the license plate which you wish to detect (here a minimum should be provided). MaxWidthHeightRatio: The maximum width-height ratio of the license plate which you wish to detect. PlateLeftPadding: We can increase/restrict the top and the left side of the already detected license plate. In this way we can modify the image part on which the license plate detection will take place. PlateRightPadding: We can increase/restrict the bottom and the right side of the already detected license plate. In this way we can modify the image part on which the license plate detection will take place. DetectableCharacters: Provides the characters as a string which can be detected. AddSchemeRefex(): If it is set to default, every detected text will be given back by the detector on every found rectangle. You can provide the pattern of the license plate by using regular expressions. GetSchemeRegexes(): Returns with the added list of regular expressions. RemoveSchemeRegex(): Picks the regular expression with a determined prefix from the list. SetDetectableChars(): The characters which should be determined can be provided as a string. By default the capital letters of the English ABC and the dash is set. ShowImage: Declares whether the original image should be shown or only the detected shapes should be seen with black background. It is important if there are more image processer algorithms are running after each other. DrawColor: The color of the selection of the detected object can be provided here. DrawThickness: The thickness of the selection of the detected object can be provided here. After every license plate recognition the DetectionOccured event is triggered. In the arguments of this event you can find the detected registration number and the characters from which it was generated by using the regular expressions. By reading through this tutorial you will be able to successfully implement license plate recognition with your C# camera application using the Ozeki Camera SDK. On this webpage you will find a free source code example which is a great help for your implementation. Moreover, this webpage contains helpful documentations to help the understanding.